We started Project Tree when we first bought the home a few years ago. Our thinking was something like “How hard can it be?” And while it turns out this is a pretty low maintenance operation, I learned that like everything else I ever try to do, I generally don’t know what the hell I’m doing. We’ve killed a few trees, stunted the growth of others, and prevented others from producing for a season. I’m probably going to have to come back to this tree thing in several posts, to cover troubleshooting, initial planting, watering, fertilization, pollination, and pruning, but I’ll start us out with what we’ve got going, and what we have to look forward to. Here’s the breakdown. We have a pluot, orange, lemon, avocado, loquat, and two apple trees, all on our average/small sized back yard. Fruit trees are typically smaller than shade trees, and come in dwarf varieties if necessary. 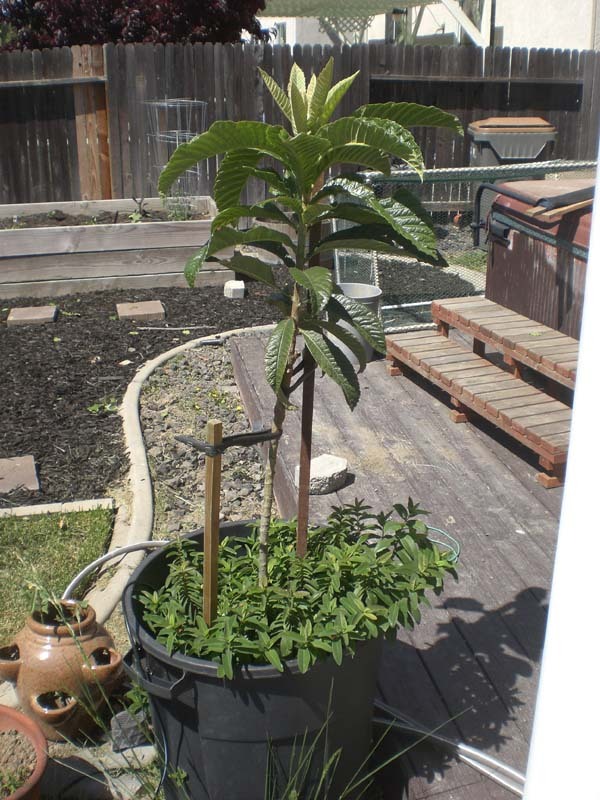 Loquat tree in a…trash bin. I encourage you to buy something more attractive if it’s in your budget. 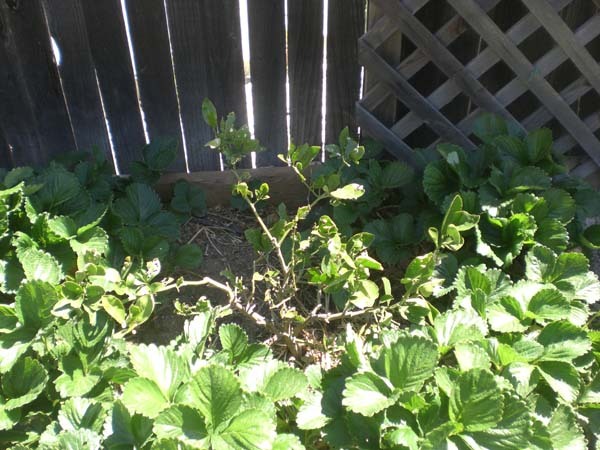 Lemon tree sapling in a strawberry patch. Think carefully about what you’ll use your lemons for if you’re thinking about getting one. I run into so many people who give lemons away at harvest because they can’t manage them all. We plan on using them for cleaning solutions in addition to food. Apple Trees (left) and avocado tree (right). All thriving with monthly fertilization and minimal watering. Notice the raised brick beds? The clay soil is absolutely disagreeable, and in the most uncharming way. Above ground you get better drainage, better soil (Which you bought and filled yourself), better control of what goes into your trees roots, and an attractive landscape. The only downside to the half circles next to the fence is that you will eventually will have to share with our neighbors, so I hope you like them. Pluot tree. The one tree we have that can thrive in the clay. This guy is directly in the ground. Notice the brick bordering? That is its 3ft growing space. 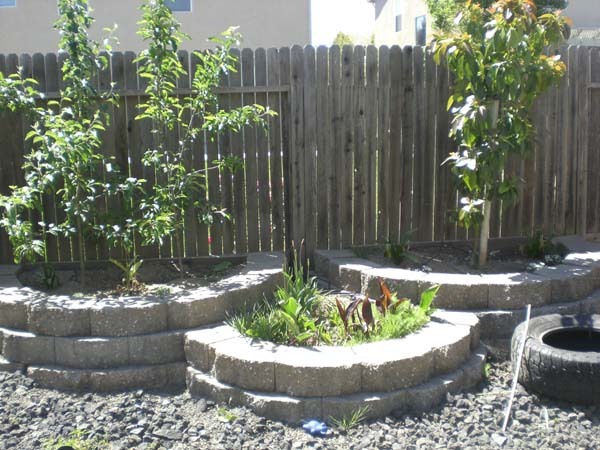 It keeps the area clear for watering and fertilization. …we’ve killed a loquat, plum, peach, almond, and avocado tree, mostly because of the clay soil we tried planting them in. Clay is very compact, obdurate can-barely-be-called-soil matter with poor drainage and for roots is like trying to go through concrete. 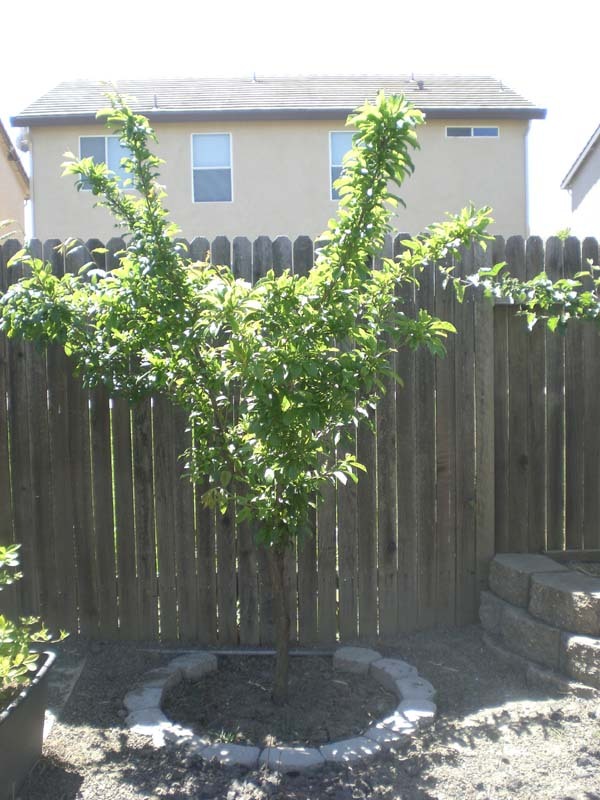 This orange tree (Washington Navel) is doing…ok. Do you notice how the leaves are moderately yellow and smallish? We are hoping for dark green, broader leaves. The yellow is expected in the early spring, but it looked like this all of last year, and it dropped all of its oranges. We tried several things to no avail, and almost resolved that the real problem was that we bought it at Walmart. We’re posting to you about this so you hopefully can learn from our mistakes. There are a few things that could be the problem. 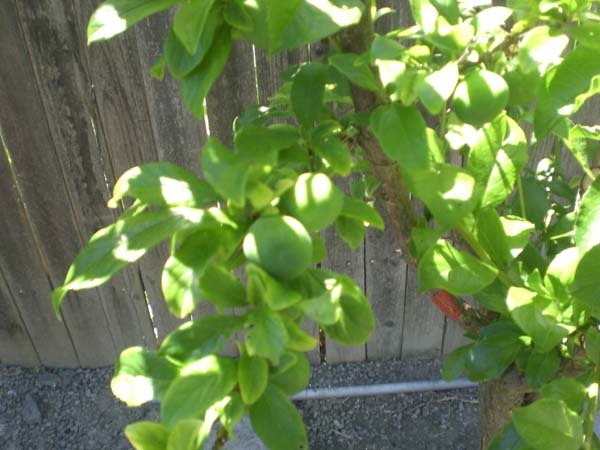 Overwatering – citrus trees don’t like wet feet. They prefer a good soaking, and then to be left alone several days to dry out. Underwatering – This is the part I got frustrated with. I know I have both over-watered and under-watered this tree in its life to date. The correct balance is about 1-3 times a week, depending on how hot it is. Not enough iron-Yellow leaves but an otherwise healthy looking tree may indicate an iron deficiency. You can buy iron supplements to sprinkle in, and that’s what we’ve been doing, receiving moderate improvement. Baby steps. Soil acidity-Looking online, some websites say the acidity of the soil is one of the most important factors to plant and tree growth. Furthermore, different species prefer different levels of acidity. Orange trees – a little more acidic (5.5-6.5). We add coffee grounds to the soil for this, but I’ve heard that Epsom salt is a good idea (1/2 tbsp diluted every 2-3 months). Work towards changing pH level carefully and slowly, over the course of several seasons. Fertilization-Citrus trees and avocado trees need a special fertilizer that is designed for them. This is something we’ve acknowledge that we pretty much have to buy. Disease- admittedly we have less experience with this, because we haven’t dealt with it yet. I wish you the same luck. 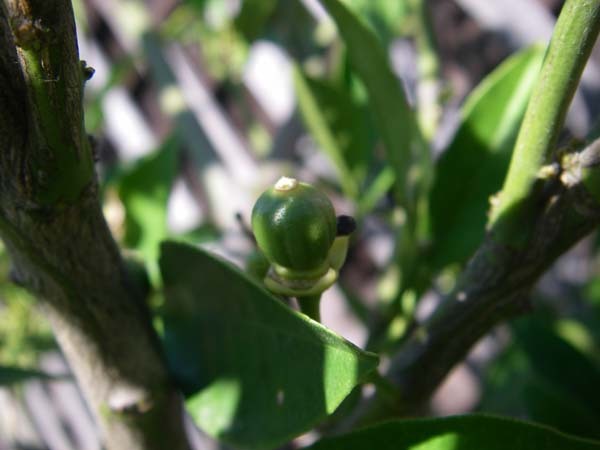 Happy to say that our orange tree is doing great now, with several orange buds growing. We’ll have to prune some off so that it can focus on growing fewer bigger oranges. Sounds amazing. Thank you for sharing. I imagine you have trouble eating all of that. 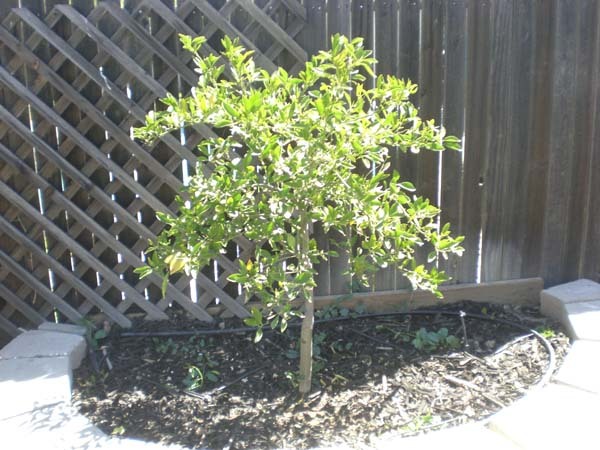 As far as your citrus trees go…I work at a nursery in Davis and the one thing we recommend most to gardeners in the Davis and Woodland area for their trees is Soil Sulfur. Our soil is very alkaline and the citrus trees are happiest with a PH of around 6.0 or 6.5. When the ph is way off, the plants will lock up and not absorb the nutrients that they need. You might think that they need more fertilizer but the plant can’t use it if the PH is all off. So a little Soil Sulfur sprinkled liberally under the drip line and watered in well should really help green up your trees. Since it works with the microorganisms in the soil it can take a month or so for it to work, but it definitely works. You can add too much though, so only add it once or maybe twice if things don’t look better after a month. Then you should be good unless you see signs again of yellowing. And don’t add fertilizer until a few weeks after adding the sulfur. Thank you. Our tree is already doing much better, but I admit it could get a little greener. I may try this out, and I will definitely let you know how it works.